The language industry has recently seen a big push for more automation in all possible areas, often powered by AI solutions. Since translation needs are forever on the rise, it quickly leads to more and more time pressure arising. This, in turn, translates into a demand to streamline project manager’s work wherever possible and also linguists’ having to seek ways to work faster. One of the ways to increase working speed, which has been gaining popularity among translators, is using machine translation as an additional aid. In this post, we look at some of the available tools that help to integrate MT into translators’ workstreams. For anyone who needs quick, seamless access to machine translation with a simple combination of keystrokes, regardless of whether it is in long paragraphs of text or single words, the handy GT4T app might be a perfect way to integrate MT into daily operations. One of its strongest points is that it is a standalone app that works across many platforms and programmes, including CAT tools. In principle, it works anywhere where text can be typed. 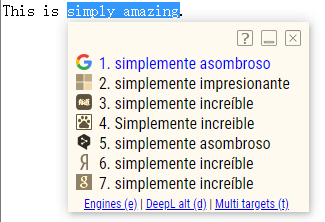 It is a simple plugin that activates machine translation with specific keyboard shortcuts. For instance, if you select a sentence, a phrase or a word and press Ctrl + J, the selected section will be replaced with machine translation. 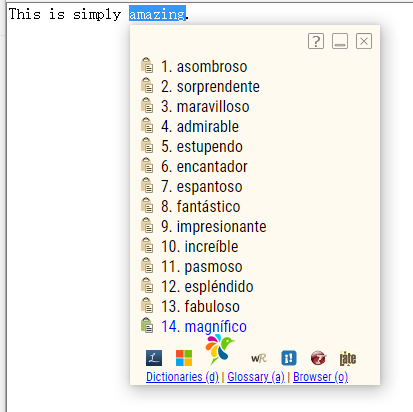 Not only does the plugin help with quick translation of text but it also facilitates managing frequently used terms. You can add specific terms that will, later on, be always translated in a specified way after pressing Ctrl + Windows key + D.
Machine translations can prove particularly helpful in gisting, obtaining terminology inspiration and they can be post-edited where necessary to reach the desired quality levels. Another helpful platform where machine translation has been taken to a more interactive level is Lilt. This US-based startup aims to give translators more control by combining the power of MT and predictive typing. Instead of getting pre-translation with MT that has to be post-edited, as the translator starts typing their translation, they see a machine translation suggestion that changes in real time to provide a logical continuation of what’s been already typed out. The MT suggestions are also adapted to the specific translation memory that is being used for the project. The user interacts with machine translation within a sentence by accepting or rejecting words or phrases. Those decisions trigger refinements of the MT suggestions for the remainder of the sentence. Lilt claims that this interactive interface helps linguists increase their productivity by 100%, which means it allows them to translate double the number of words than before in the same amount of time. A vast array of CAT tools now also have machine translation integrated within them, so that translators can access and leverage MT for their work without having to leave the CAT tool. MemoQ also offers this possibility. MemoQ can connect to a variety MT providers through plugins. After authenticating with the desired provider, machine translation suggestions will show in the results list in addition to the translation memory matches. This can prove particularly helpful in segments with no translation memory hits as well as segments with strings of number and dates. Translators can decide when and to what extent to use them. Trying out a few different providers might help in determining which one gives the best results for specific types of content in terms of quality. There is no shortage of useful tools that offer streamlined access to machine translation. Although MT has proven to increase productivity with certain types of content and in certain languages, it is up to each linguist’s individual preferences to what extent they want to engage with it. Is Machine Translation Alone Enough? Sign up to receive the machine translation newsletter.